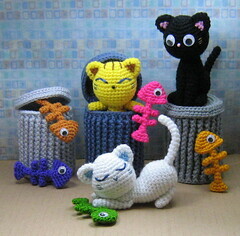 Here is another set of crocheted cats I've finished. The crochet pattern for this "Alley Cats" set is available here. The pattern includes the cats, the garbage cans & the fish bones.